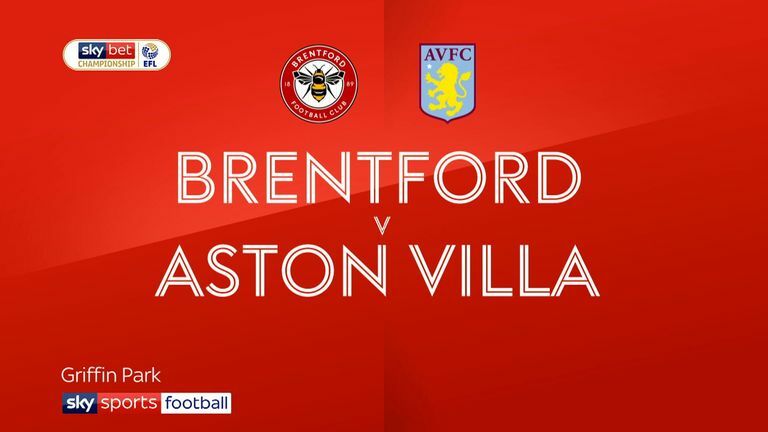 Neal Maupay struck a clinical stoppage-time winner as Brentford beat Aston Villa 1-0 on Dean Smith's return to his former club. The Bees had been the better team for the entirety of the first half and missed numerous chances to open the scoring, Sergi Canos notably forcing Villa goalkeeper Lovre Kalinic to tip a dipping volley over the bar early on. Smith's side seemed to come to their senses after the break, but Daniel Bentley was rarely tested, though he did well to stay alert to block Conor Hourihane's shot with 23 minutes to play. 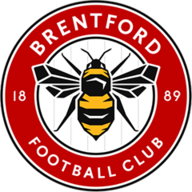 Brentford looked as though they would be left to rue their failure to convert their attacking display into a win, but Maupay hit the top corner in the second minute of injury time, to leave Villa without league win at Griffin Park since 1947. On the night Smith returned to Griffin Park for the first time since his departure in October, it was his side still harbouring realistic hopes of a play-off chase, yet it was his former players who dominated proceedings from the first whistle. 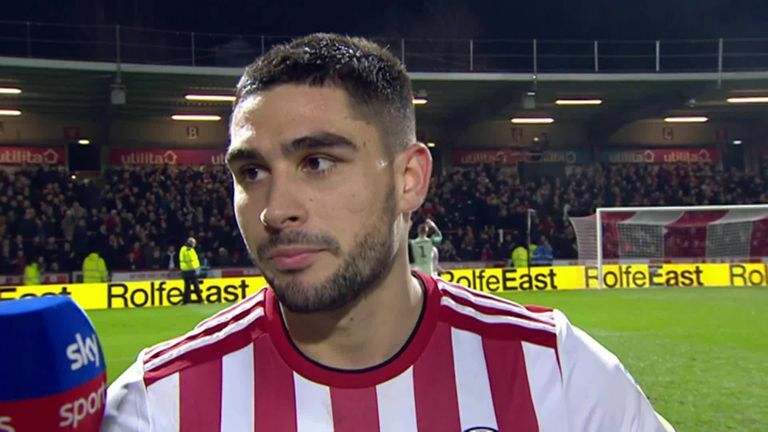 Brentford's Romaine Sawyers hails teammate Neal Maupay after scoring a stoppage time winner. Though Thomas Frank denied it prior to kick-off, the Bees stuck with the 3-4-3 formation that has served them so well recently, and it was makeshift right wing-back Canos who was the first to go close when he forced a smart save out of Kalinic from 20 yards. The severe pressure from the hosts showed no signs of letting up as the half wore on; Moses Odubajo struck the side netting, while Maupay half-heartedly appealed for a penalty and Said Benrahma shot wide on the swivel. Albert Adomah could have dealt the Bees a sucker-punch moments before the break when he managed to get goal-side of Odubajo, but goalkeeper Bentley rushed out to narrow the angle and the winger dragged the shot across the face of goal. Thomas Frank made just one change to the side that lost 2-1 to Nottingham Forest at the weekend, with Sergi Canos - having scored four goals in his last four games - replaced Henrik Dalsgaard. Frank confirmed prior to kick-off the Spaniard would not be occupying a wing-back role, as Bees returned to a back-four. Meanwhile, on his first return to Griffin Park since leaving for Villa in October, Dean Smith swapped Neil Taylor, Mile Jedinak and Jonathan Kodjia for Kourtney Hause, Glenn Whelan and Albert Adomah. Smith sent his troops out to stop the hosts from playing their passing game after the break and, for the first 15 minutes or so, it worked. Canos found fewer pockets to race into, while Hourihane was denied the chance to strike on the counter when Bentley raced off his line to close down the shot with his arms outstretched. Frank's team continued to tinker around the Villa 18-yard box to no avail, but in stoppage time, they finally made their long spells of dominance worthwhile. Tommy Elphick prematurely went to ground, allowing star man Maupay to cut inside Tyrone Mings and bury the winner. The Algerian winger is at the heart of the action for the Bees of late and for good reason. The pass that set up Maupay's 21st goal of the season was Benrahma's 13th assist of a remarkable first season in English football. One of the previously unknown entities brought to the club as part of their statistics-based recruitment approach, the 23-year-old's value is rising at Griffin Park and he looks a tantalising prospect. Thomas Frank: "It's a very big win, mostly because we've been talking about this very good run of 10 games unbeaten, which has proved that we are a good side and we said before the game that good sides bounce back straight away. 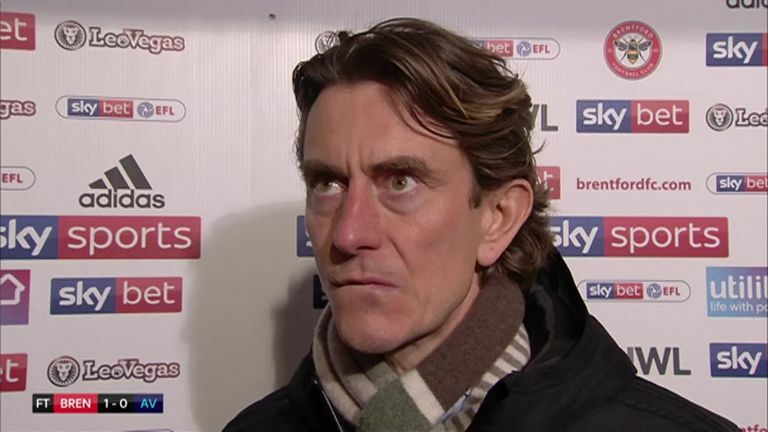 Brentford boss Thomas Frank hailed his team after winning 1-0 to Aston Villa at Griffin Park. "I'm very pleased, not only with the result, mainly with the performance, which was bang up there, because I think we dominated and controlled the game, every single minute of it. We got a beautiful clean sheet and I'm so pleased with this." Dean Smith: "They played very well, but they've done that for the last three or four years here; they've got good players who can pass and move. The disappointing part of tonight and probably the most frustrating is that the big chances fell to us tonight and we've missed them. 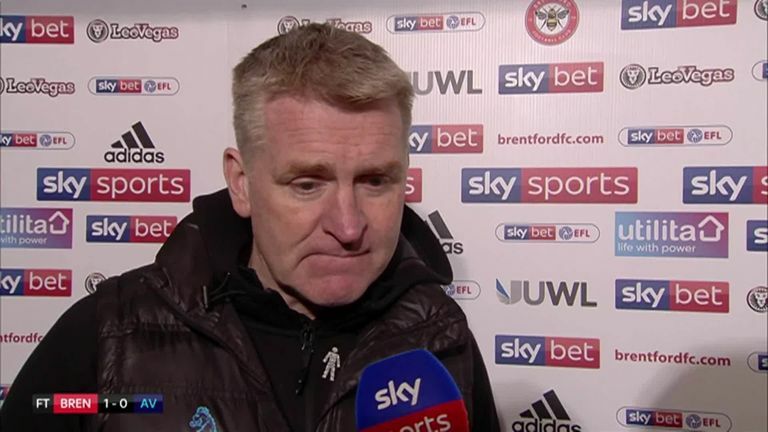 Aston Villa manager Dean Smith was left frustrated and disappointed with a 1-0 result at Griffin Park. "Goals change games and it would've opened them up a little bit more if we'd have got that goal. We should have had a penalty as well, but Neal Maupay has done what he's done all season and scored a really good goal at the end. Disappointing and frustrated because, on the scale of chances, it wasn't what we deserved." 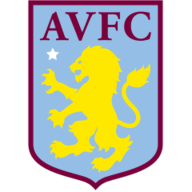 Aston Villa host Midlands rivals West Brom on Saturday afternoon at 3pm, while Brentford are in FA Cup fifth-round action on Sunday at 4pm. They face Swansea at the Liberty Stadium looking to earn a place in the quarter-finals of the competition for the first time since the 1988/89 campaign.